The two-time Boston Marathon champion turned onto Boylston Street with a sliver of a lead, leaning in front of two others with the finish line in sight. But one of them was Lawrence Cherono, the fastest man in the field. And he needed every bit of his speed. One year after an icy rain and a near-gale headwind resulted in the slowest winning times in four decades, race organizers again prepared for the foul New England weather. Heavy rain and thunderstorms forced marathoners to take shelter for a time on Monday morning, but the weather settled down in time for the race to start on schedule and the sun even made an appearance about halfway through. "This is what everybody strives for, works hard all year long to have this," Laura Fenster of Fresno, California told NBC10 Boston. "It's a blessing, it's a pure blessing." Linden took advantage of last year's storm to splash her way to the first win for an American woman since 1985. But with conditions back to normal, so were the results: East Africans from Kenya and Ethiopia dominating the podiums. "I knew it was possible, it was just a matter of everything coming together," Romanchuk said. 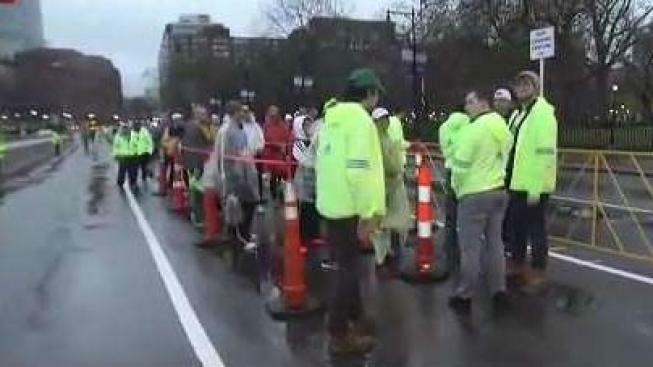 Officials estimate $30 million will be raised for charities during the marathon. About 1 million people are expected to attend the race. This year's event falls on the sixth anniversary of the 2013 bombing that killed three people and injured hundreds more. Boston officials are planning a moment of silence at 2:49 p.m., the time of the first explosion. Police also had extra patrols to ensure the public's safety. About 7,000 law enforcement officials will be providing security for the race. "We know what happened before," Boston Police Commissioner William Gross said. "Let's be each other's eyes and ears. This is our city, our marathon, let's look out for each other." Authorities said Monday morning that there was no credible threat against public safety at this year's race. They stressed the importance of acting on the phrase, "see something, say something." 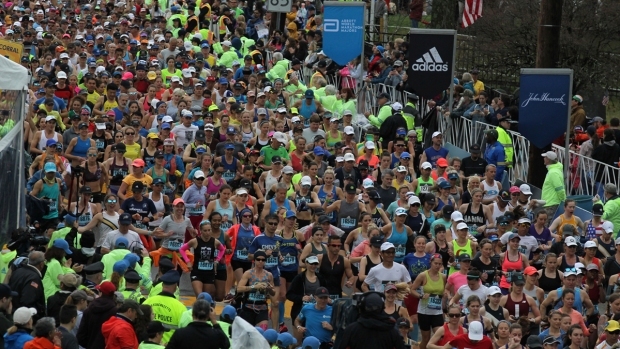 Spectators went through security checkpoints, and items including weapons, backpacks, coolers, rolling bags, blankets and glass containers or cans were banned from the race route. Only one day till #MarathonMonday ��‍♂️��‍♀️! Ginger Howell, a 33-year-old professional triathlete who is running her sixth Boston Marathon, said she finished the 2013 race 25 minutes before the bombings and was on the train home when the twin detonations went off near the finish line. Three people were killed and hundreds were injured in the terror attack. Thinking back on the day has taught her to appreciate being present at the race, and in life. "Even if you run slower than your goal time, thinking about the bombing puts everything in perspective," Howell said. "The Boston strong attitude made a big difference. When people think about the Boston Marathon now, they think about people coming together and overcoming adversity," she added. Howell was among the throngs of runners gathering in the tents outside of a high school in Hopkinton, Massachusetts, ahead of the race. 8:30 a.m.: Streets in the Brighton area leading to the route. Boylston Street is expected to reopen at 8 p.m., while all other streets are slated to reopen at 7 p.m.